Posted April 23, 2014 in Uncategorized. For this post, I thought I might spend some time on Captain Victory, the title that Kirby created for the Independent company, Pacific Comics. Coming after what many fans believe were Kirby’s peak years, this series has not received much attention, but there is a good deal of wonderment and quality stuff to be seen therein. Through the seventies, as a result of a boom in science fiction based films such as Star Wars and Close Encounters of the Third Kind, the notion that Earth would be visited by beings from another world was an idea that the King also felt compelled to exploit. In Kirby’s series, the extra-terrestrials visiting Earth were not nearly as friendly as the cuddly E.T. or the seemingly benevolent aliens from Close Encounters of the Third Kind, and a force of Intergalactic Raiders was deemed necessary to fend them off. Steve Sherman, Jack Kirby’s assistant during the 1970’s had this to say about the development of Captain Victory. “Capt. Victory was originally written as a screenplay. It was titled “Capt. Victory and the Lightning Lady” and was a science fiction story about a small town USA invaded by aliens. There were hardly any outer space sequences (as I recall). Jack realized that he needed visuals to help market the script, so he began “story boarding” when he had time. When Pacific Comics approached him about doing a book, he felt that using Capt. Victory as a character would be a good idea so he expanded on the story. 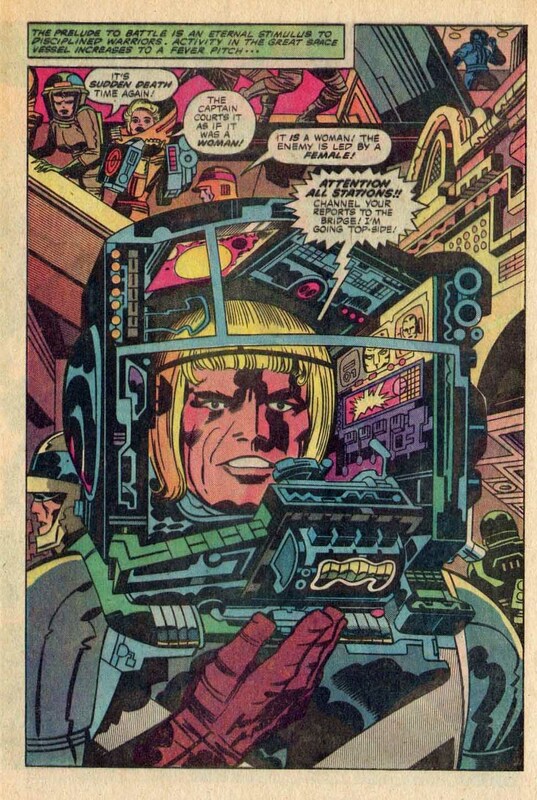 Here above on page seven of the title’s first issue we see Captain Victory donning a helmet referred to as a portable command post, so he can defend the ship from attackers. The Captain looks very much like the blonde Nordic god-like heroes we are used to seeing from Kirby, such as Thor, Orion and Ikaris. In fact, we are later to discover that Captain Victory is directly related to the New Gods’ Orion. 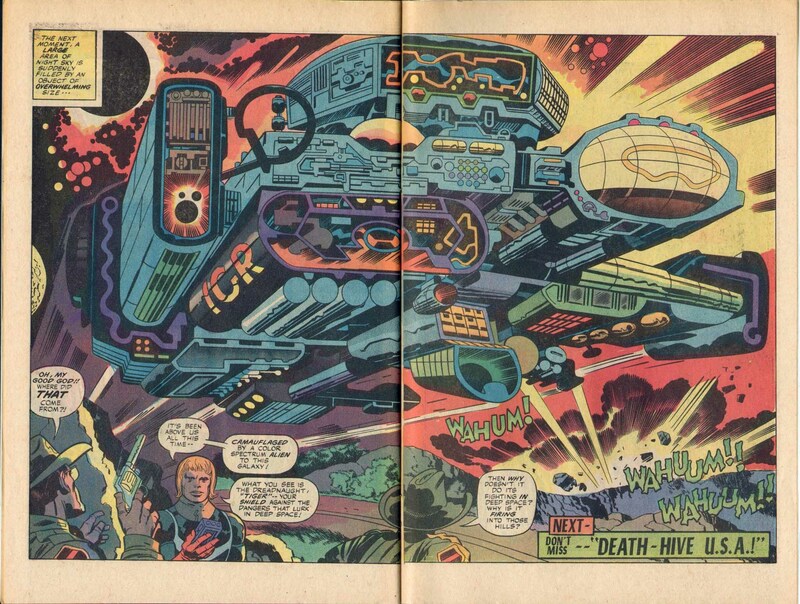 In this double spread on the following pages above, we see the attacking aliens, known as Insectons breaking through a force field, while Captain Victory defends the bridge. There is that wonderful circular sweep of action as the reader’s eye moves leftward from the Insecton ships to the intricate cannon like shape on the right and then back to the Captain’s blocky muscular helmeted figure just left of center. Based on this composition, it is clear Kirby’s design sense is as strong as it has ever been and his drawing skills are still quite formidable. On page thirteen above, we see the interior of the Insecton ship and the nefarious Lightning Lady, ruler of the race giving instructions to her minions. 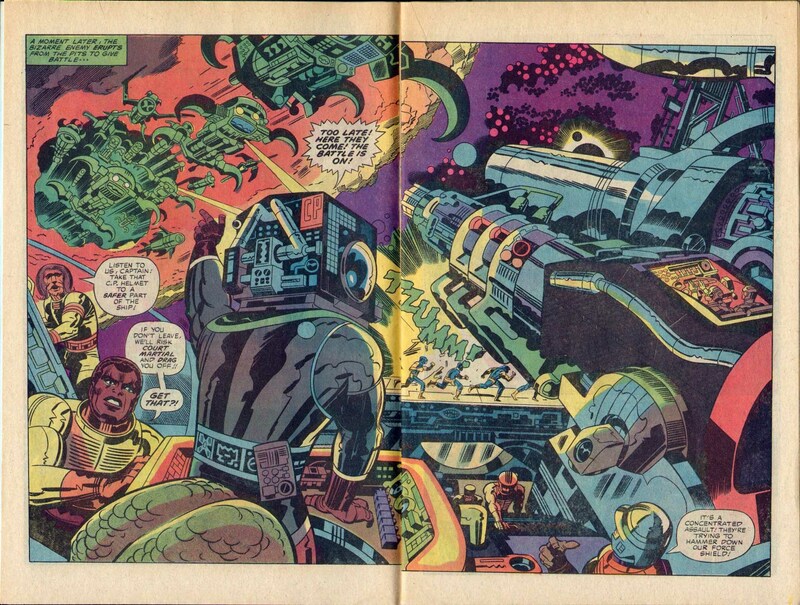 The first panel is a classic Kirby environment, as the King weaves the sinuous composition of a high-tech hive-like structure. As is customary, the structural design fully supports and enhances the interplay of figures gesturing, and also enhances the passage of space/time within the panel. The third panel carries on the hive like motif as we see the various creatures in their cells, performing necessary functions to the powering of the ship. Finally, we see the final spread of Captain Victory #1, the Galactic Raiders “Dreadnaught Tiger”. This is a massive spaceship that with its array of lights and hi tech equipment could easily have appeared in the film, Close Encounters of the Third Kind. The colossal craft faces us in forced perspective, hovering ponderously and taking up most of the two-page panel. 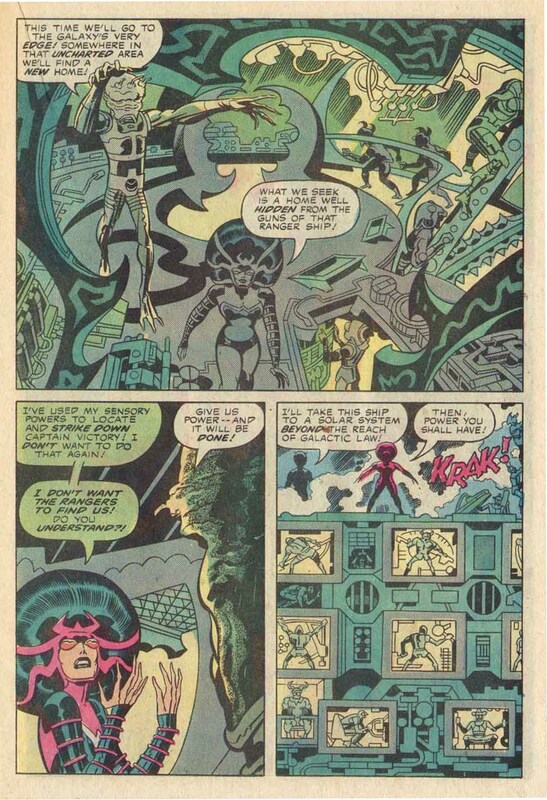 This tableau is a fitting ending and a dramatic climax to the story, nearly comparable to our first view of Galactus at the close of Fantastic Four #48. And so we see the excellence of Kirby’s work in 1981, still capable of thrilling us while giving us a good deal of food for thought.